NTN Corporation (hereafter, NTN) will exhibit at the 16th China International Machine Tool Show “CIMT 2019” held in Beijing, China, from April 15 to 20. This event is the largest machine tool-related exhibition held every two years in China. A large number of companies related to machine tools, including machine tools, spindles, and tools will exhibit at this event. 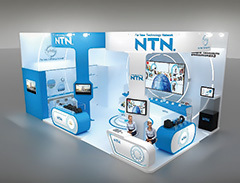 This is the third exhibition of NTN since its exhibition in 2015. Under the theme of “Navigate Your Future - NTN ULTAGE -,” NTN exhibits products and technologies for machine tools, including the ULTAGE* series of precision roller bearings for machine tools. 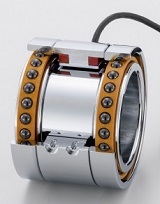 In addition, as products and technologies that contribute to the recent trend of “collaboration between machine tools and robots,” NTN will also exhibit the “i-WRIST™” Wrist Joint Module and bearings for robotic gearboxes. This is NTN's new generation of the world's highest standard of precision bearing series that supports high-efficiency processing, high-reliability, high-quality processing and environment-conscious design required for machine tools. 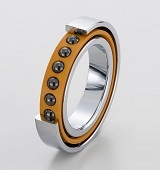 Demonstrates excellent ability due to such factors as the adoption of seals on both sides, special grease, special material/surface modification and also the optimization made to the internal bearing design. This product has a high-speed rotational performance of dmn value* of 1.6 million as well as 1.3 times the load capacity and allowable axial load compared to NTN's conventional products. This enables a single machine tool to cover the rough machining work and finishing processes that previously required numerous machine tools, and also helps to further increase productivity of machining centers, turning machines and complex processing units. 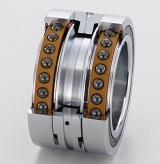 By using sensing around the bearing raceway surface, this product can prevent seizure together with advanced condition monitoring in machine tool main spindles. Preventing seizure before it occurs reduces the man-hours and cost involved in procuring parts and replacing the main spindle when the main spindle on a machine tool has seized. It also decreases the time until the machine tool can resume operation and provides an improvement in productivity and reduces costs. Furthermore, it contributes to an improvement in reliability because regular maintenance can be performed more accurately. Applying NTN's proprietary air-cooling technology, this product has an increased high-speed rotational performance and rigidity of 10%. 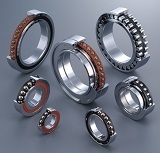 This means that grease lubricated bearings, which are beneficial from cost and environmental perspectives, can be used in machining centers, complex processing units and other high-speed equipment where air-oil lubrication is conventionally required. Positioning equipment that achieves a wide range of angle movement, and is both compact and space-saving. This can move like human wrist at high-speed to perform minor position (angle) changes, which vertically articulated robots are not good at doing. “i-WRIST™” contributes towards the automation of various processes, makes them efficient and reduces manual labor. These processes can include appearance inspection, grease application, and cleaning when combining “i-WRIST™” with other robots and attaching end effectors to the tip of the equipment.